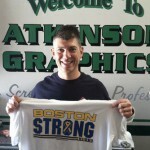 Atkinson Graphics is a family-owned & operated, full service Custom Apparel & Screen Printing Company, located in southeastern NH. We specialize in custom t-shirt design and printing! For over 20 years, we’ve been putting sweet threads on our customers’ backs and smiles on their faces! By offering a large selection of apparel & products, combined with the advanced on-site printing & embroidery equipment, highly skilled employees, and a full in-house graphic design department, we make it easy and affordable to create eye-catching promotional products. Atkinson Graphics has the ability to print any size order. Using one to eight colors, we are a fully automated company which allows us to get the product to our customers faster and more cost effective. This automated process has several advantages, one being consistency. We strive to ensure that your order is printed the same way with the same specifications, every time, on time! Printing for customers for 20 years! I’ve been working with Dave for many years, and I can tell you that they are top-notch. Great pricing, excellent printing quality and the team takes pride in their work. If you are looking for a screen printer who really cares about your project, you won’t go wrong with Atkinson Graphics. Bill A.
We’re committed to serving our local community. We enjoy opportunities to give back to the community by using our skills and talents to help support local causes and make a positive difference in our community. Like us on Facebook for news on specials, sales, new products & services, and more! 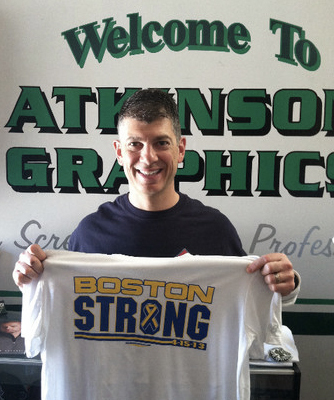 Atkinson Graphics is a family-owned & operated, full service Custom Apparel & Screen Printing Company, located in southeastern NH. We specialize in custom t-shirt design and printing! For over 20 years, we've been putting sweet threads on our customers' backs and smiles on their faces! By offering a large selection of apparel & products, combined with the advanced on-site printing & embroidery equipment, highly skilled employees, and a full in-house graphic design department, we make it easy and affordable to create eye-catching promotional products. Learn more.